Susan Tom is no ordinary woman. Once upon a time she gives birth to two sons. Then she starts adopting some more. Her husband leaves at the fourth. She can’t seem to stop accumulating them. Only the capacity of the house sets a limit to the perpetual influx of children. Some of them have health problems. And that’s a gross understatement. Joe has cystic fibrosis, a nasty disease in which the mucus in the body builds up, especially in the lungs, and leads to frequent inflammations and difficulty in breathing, and ultimately to an untimely death. He also has attention deficit hyperactivity disorder to top it with, involving sudden anger outbreaks directed towards his younger sisters. Anthony’s got what experts call recessive dystrophic epidermolysis bullosa, a hideous terminal illness. It simply manifests in a gradual loss of the skin by peeling off. Anthony has no hands and feet to speak of. Oh, and he’s got cancer, too. Squamous cell carcinoma, to be exact. Susie had the same until she dies. Xenia was born without legs. She figure skates using her hands. Hannah – no legs whatsoever. Faith’s face and right arm burned down completely when she was an infant. She likes math though. Cloe is not able to bend her elbows and knees due to another rare congenital disorder (arthrogryposis). Katie was born with fetal alcohol syndrome and is not quite alright in the head. Libby’s spine is not closed properly (spina bifida). A medical dictionary could be filled with these kids. 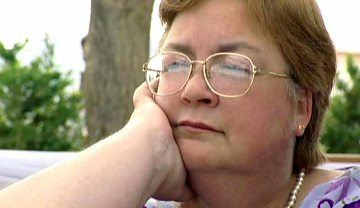 The Tom family was the subject matter of the documentary My Flesh and Blood (2003) that chronicled a whole year in their lives. Out of thirteen children altogether, eleven are adopted, three have/had terminal disorders, and six have severe disabilities (five of which could not live without a wheelchair). There’s one apparently healthy, teenage daughter, Margaret (she had brain surgery in her infancy), around the house who helps Susan with the everyday chores and the kids. She suffers a nervous breakdown in the film. What special ingredient does one have to possess in order to knowingly adopt a child whose imminent demise is inevitable? Even one such kid is plenty to tackle psychologically, for an everyday parent that is. But this woman is so genuinely and inherently good-hearted that she’s virtually unable to leave a disabled child upon sight. Mind you, it’s not an obsession with her, she’s a perfectly normal single mother. Still, ordinary parents may think she goes way over the top in her charity, but some sort of inner force must reside within her that makes her gather all these children with special needs. I don’t claim to know whatever that force may be, but one certainly needs to be in possession of tremendous mental and physical strength to be able to go through all this. I mean, she’s willing to lose children provided she’s managed to make them feel belong to a family, make them feel whole, make them feel loved. Such altruistic behaviour is inconcievable to most of us. Well, let’s just put it thus: she loves kids to a fault. Susie dies prior to filming. Joe breaks his own ribs during a coughing fit and suffocates in the course of shooting. Anthony succumbs to skin cancer shortly after filming finished. Kids come and go, but one thing remains: Susan Tom is an extraordinary woman. You did an awesome job on my Flesh and Blood . It was a very inspiring movie !!! Just watched it last night..she is a inspiring woman..I hope things get better for her and the kids. Poor Joe , may he rest in peace. No one could understand him but his adopted mother. It certainly hit me in my heart when Joe died. It was sad also to find out that Anthony passed away ..but he is with his sister Susie may they both rest in peace. I just watched it for the first time on Youtube myself…. It seems that her website is down…. I would really like to donate to her as she seems like she can always use the help.